be sure we can represent you. A rough estimate will work. for your consultation that works for you. right away to confirm your appointment. Electronic Case Filing We connect directly to the bank-ruptcy court so we can file all your documents quickly and se-curely. There are times during your bankruptcy when it is impor-tant to know the exact status of your case. Streamlined confir-mation of your case-data, filings, and pleadings saves you time and money. 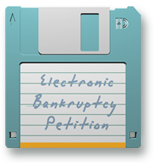 When we electronically file with the bankruptcy court, up-dating your information, revising your bankruptcy, or even modifying your Bankruptcy Plan is easy and quick. Same-Day Rush Case Filing Tick Tock. Knock-Knock. 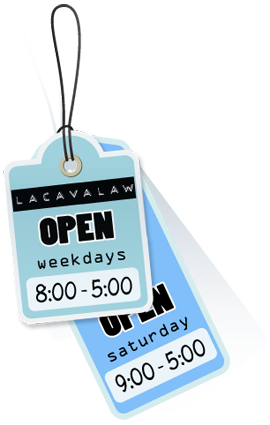 We know sometimes things go from bad to worse.Lacavalaw can file your case in one afternoon. This can mean the difference between losing your home and saving it, or losing thousands of dollars in garnish-ments. We know deadlines are important when times are tough and that in such cases Time is of the essence. 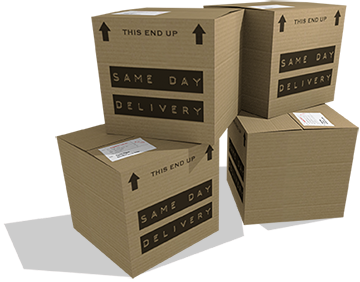 We have filed hundreds of same-day cases. When you are in a jam, call us right away, we can file your case the same day. Please... Stop Calling Not only do we represent you in court, but we also represent you to your creditors. When you hire Lacavalaw, we immediately inform those people you owe, that from here forward they need to call our offices to discuss your debt. No more calls to your cell, your home, your employer, or your family members. Collection calls come to us so you can answer your phone again. "Hey, We&apos;ll take a message." :) Oh, and we know you get Mail about your debts... Those come to us, too. We&apos;ll open & file them and respond judiciously. Did we say &apos;It&apos;s good to be repre-sented by Lacavalaw&apos;? Cuz it is. Matching the Numbers Most people file Chapter 7, 13, or 11 cases. Within these Chapters, there are many rules, allowances, exemptions, legal guidelines, and well... thousands of other factors which determine how your bankruptcy works out for you. Knowing each bankruptcy regula-tion takes experience. A custom designed bankruptcy will make a huge financial difference to your outcome, but a cookie-cutter bankruptcy, can be awful. When shopping around, make sure your attorney regularly files 7&apos;s, 13&apos;s & 11&apos;s, so you won&apos;t get fed the wrong one. 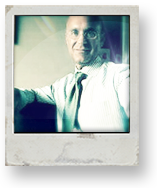 We have years & years of experience tailoring all types of bankruptcies. 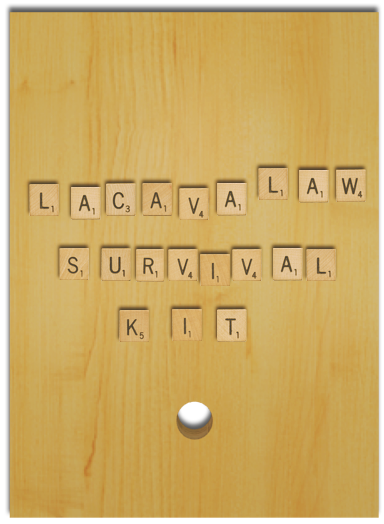 Lacavalaw offers a free consultation with an actual bankruptcy attorney. This is a great opportunity for you to learn how bankruptcy may work for you. There is no pressure to hire us or to go forward with a bankruptcy. During your consultation, you can ask any questions you like. For example, you might discuss which debts to attempt to pay down first. Knowing the difference between how secured, priority, and non-priority secured debts are handled in bankruptcy could help you decide how to go forward. We can advise you on the particulars of your situation based on the law and our years of experience. 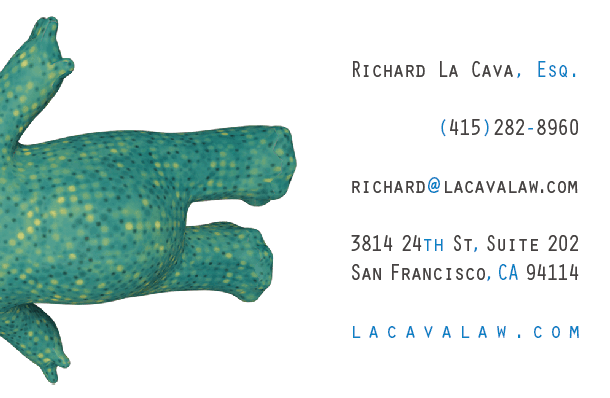 Call Lacavalaw at (415) 282-8960. If this is your first call to our offices, leave a couple minutes open so we can ask you a few questions about your situation. When you meet for your free consultation, we will ask you to bring a short list of documents. You may also request a consultation in the form below. 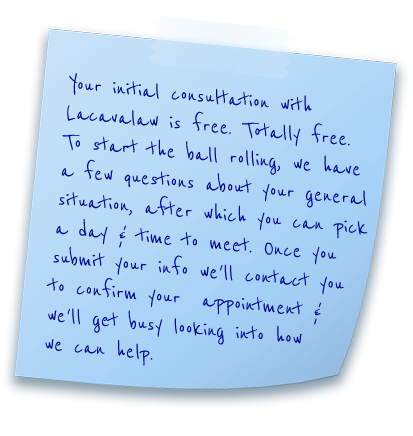 Your initial consultation with Lacavalaw is free. Totally free. To start the ball rolling, we have a few questions about your general situation, after which you can pick a day & time to meet. Once you submit your info we&apos;ll contact you to confirm your appointment & we&apos;ll get busy looking into how we can help. Just your county is fine. We want to be sure we can represent you. consultation that works for you. touch right away to confirm your appointment. In a rush? well, we'll get to the point. Our offices can complete your bankruptcy and get your case filed in one afternoon. We have filed hundreds of same day bankruptcies for people just like you. 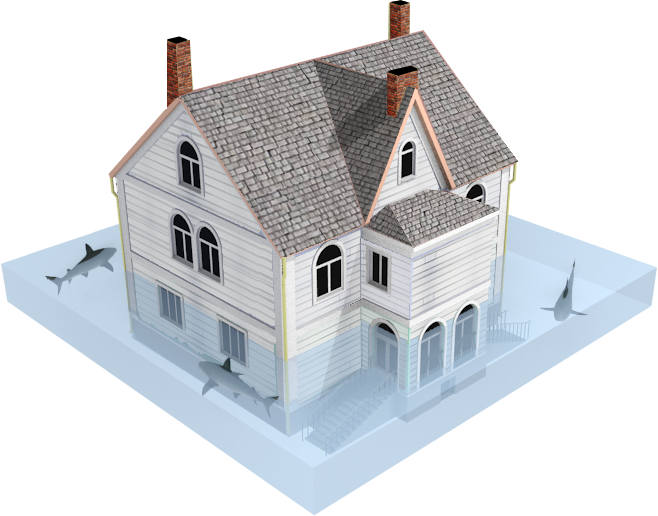 If you need to stop a foreclosure sale, a garnishment or a withholding, and time is up, we can help. In one afternoon your case will get filed. Phew! When Will My Second Mortgage Be Removed? Your second mortgage — and your third, fourth, etc. — will be considered a nonpriority unsecured debt when we file your case. What? 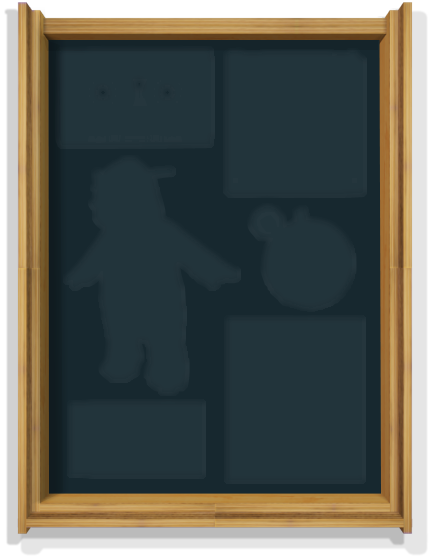 Ok... here's what this means to you in bankruptcy. Just like, say, credit card debt, in Chapter 13 you will make small payments toward this debt through your Bankruptcy Plan. When you complete your plan — usually the court extends your time to pay what you can to five years, anything unpaid on the mortgage is wiped out. So… when you file Chapter 13, right away you stop making your second mortgage payments! At the end of your bankruptcy, your second mortgage lien will be removed from your house no matter what you owe on it. Lacavalaw is on social media to make it easier for you to keep in touch with us. Ya, we're on facebook. It's where we post links to financial news, but it's also where we have a complete rundown of how bankruptcy works. It's not too long, but it is full of information that you will find useful. Our facebook page is https://www.facebook.com/lacavalaw The link to How Bankruptcy Works is at the top of the page or you can click here to go there. Get in touch with us 24 - 7. Ask us anything about bankruptcy, or about setting up a free consultation, or we can chat on the phone for a few, whatever. If you are in a jam, this is where you can contact us at anytime of the day or night. We're cool & we're here to help. Your debts may fall into one of four types: Priority, Secured, Unsecured Non-Priority, and Special. Your Priority Debts typically include your taxes if they are less than 3 years old, and some kinds of spousal and child support payments which are past due. 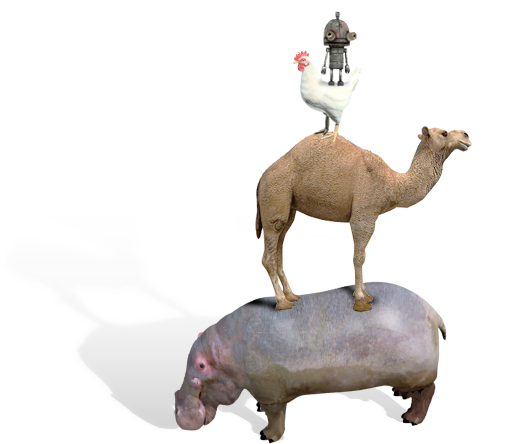 Your Secured Debts could include mortgage loans, car loans, and furniture and jewelry loans. If any of your property is used as collateral for a loan, then the debt is one of your secured debts. If someone you owe has recorded a lien against your property then that debt is also secured. You may be able to wipe out this type of lien in Chapter 13 or 11 bankruptcy. If you're behind on your Mortgage payments, your Chapter 13 or 11 Plan will repay your missed Mortgage payments up to the date you file for Chapter 13 or 11. Your Unsecured Non-Priority Debts could include your taxes from more than 3 years ago, your credit card debt, medical bills, and any personal loans you owe. * Some of your student loans. There are about 8 general steps in a bankruptcy that require action on your part. In total, however, there are actually many, many other steps, but these are taken by Lacavalaw for you. When we represent you in your bankruptcy, we complete and submit your petitions, court filings, respond to your creditors, etc., and we always attend hearings with you, or appear on your behalf, through the length of your bankruptcy. We will ask you about 20 questions over the phone. The goal is to determine if we can represent you, and based upon the information you give, we will offer you an estimate for the cost of your bankruptcy. You will be asked to collect some basic documents about your earnings, home, and any letters or notices you have received from people you owe. Some we will get for you as part of your bankruptcy - like a current copy of your 3 credit reports, but most documents you probably already have, like your tax returns, and pay stubs. After your phone interview, we can schedule an appointment for your Free Consultation. Available times are usually Monday through Thursday 9:00AM to 6:00PM, Friday 10:00AM to 5:00PM, and Saturday mornings or afternoons; If you need another time or location, it's cool, we're flexible. Your initial consultation with our office is free. In this meeting you may ask any questions you like and the attorney will advise you about your options, and choices. Our attorney is an expert with current bankruptcy laws & regulations and has many years of experience. You can see if bankruptcy makes sense for you with no pressure and no obligation. You may take as long as you wish to make a decision. Maybe bankruptcy is an option only if your situation worsens, but things have a good chance of getting better. In such situations you may have time on your side. In other cases, you may choose to seek bankruptcy relief sooner rather than later. The choice is yours to make in the time you need. Once you are ready to start the process we will go over our promise to you. Unlike high-volume bankruptcy processors, we take care of everything – court appearances, dealing with your creditors, and all the filings with the court. The information that you bring to your free consultation should be everything we need. Credit Councelling is required by law, but don't worry we have it available online so you can complete it without a fuss. Your Meeting of Creditors is normaly the only court proceeding you will attend. We will attend other court appearances on your behalf. In Chapter 7, 60 days following your bankruptcy hearing you will receive a discharge order from the court which will wipe out your debts and you will be totally debt free. In Chapter 13 or Chapter 11, your debts are totally cleared following the completion of your scheduled repayment plan; normally about five years. OK... where to begin? ... Let's just put it out there; If you are in trouble, there are people, companies, organizations, non-profits, agencies, etc., etc. which see you as their opportunity to make money. You have to take care, do your homework, and be careful. Debt Settlement Companies might give advice on how to deal with your bills or create a plan for repaying your creditors, but the FEDERAL TRADE COMMISSION notes that debt settlement has risks. It also assumes that you have years to spend living with your debts. Before you go down such a path, investigate complaints and proper licensing of the debt settlement company with the State Attorney General and the Consumer Protection Agency. Make sure you get debt settlement companies to put in writing: costs, what your debt will be at the end, and how long it will take to become debt free. Check to see if what they say is different than what they put writing, and read each contract carefully. This is harsh, but truth is, no legitimate organization will loan you money if you have bad credit. But this doesn't mean that loans are hard to come by. 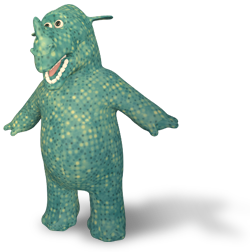 Some loans are dangerous, likely preditory, and 'Advance Fee Loans' may be illegal. So... one last thing. Beware of anything you get in the mail which promises to repair your credit. It is very likely you are looking at a mass marketing Credit Repair Scam. LACAVALAW, Richard A. La Cava & The Affordable Bankruptcy Center represent clients throughout Northern California, San Francisco Bay Area, North Bay and East Bay, including the counties of Alameda, Contra Costa, Marin County, San Francisco, Napa, Sonoma, San Mateo and Santa Clara. Our offices can best help you if you live or work near San Francisco, San Mateo, Redwood City, San Bruno, Daly City, Millbrae, Emeryville, El Cerrito, Foster City, Hillsborough, San Jose, Oakland, Berkeley, Richmond, Hayward, Castro Valley, Pleasanton, Walnut Creek, Concord, Mill Valley, Sausalito, Petaluma, Santa Rosa and Martinez. © 2012-2016, Richard A. 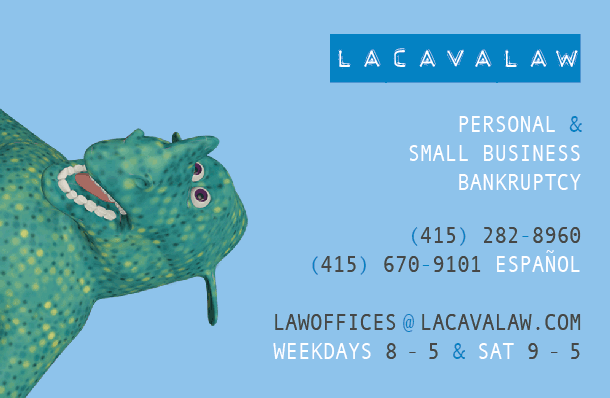 La Cava & The Affordable Bankruptcy Center. © 2016, Law Offices of Richard A. La Cava, A Professional Corporation. © 2016, LACAVALAW. All rights reserved.